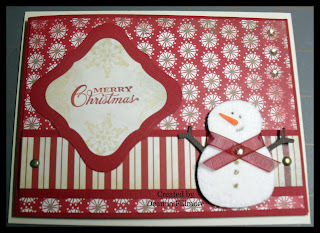 L'il Dee's Crafting with a Kitten: Merry Christmas Snowman! I'm am so far behind with my Christmas shopping and shipping!!! I finally finished my shopping for my family back east and will be sending it tomorrow. I still needed to make one more card for my parents. Here is the last card I needed to make and send. The paper is from the Fancy Pants "Saint Nick" line. 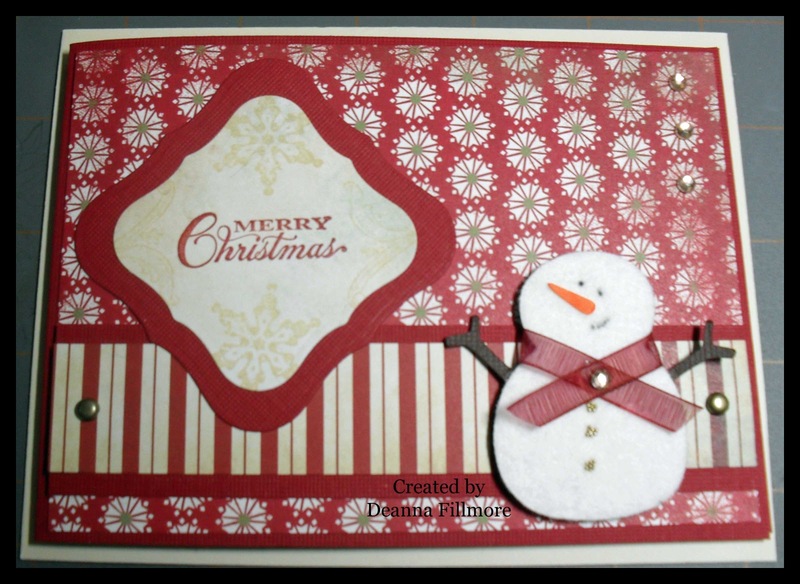 The snowman was cut out using the cricut doodlecharms cartridge and covered with white fun flock. I used micro beads for his buttons. The greeting stamp is from Bombshell and stamped with vintage mahogany. I popped the snowman up with 3d foam dots and added some rhinestones by kaiser crafts. Well that's it for tonight, I have to work in the morning. I will be back with my second post before long LOL!